It happens. You start a great new workout plan, you’re being consistent, food prepping, hitting all your goals...and a business trip or family vacation pops up. You may be full of confidence that it won’t be a problem--the hotel website says there’s a gym, or the aunt you’re staying with has started eating healthy, too--but as it often does, life happens. The best laid plans can be difficult to maintain even during your regularly scheduled week; taking your show on the road can throw all sorts of wrenches into the works. The hotel’s gym can be out of order. Your aunt has decided to make all the family comfort food favorites while you’re there. The conference runs late every day, and the only thing they provide are doughnuts and sandwiches. You may not be able to go through your exact routine, but you’ll be able to stay on track if you can think about the motivation behind the moves, instead of exact lifts and weights. A light warmup and a bodyweight routine that shadows your existing workout plan can keep your muscles mindful of what you’ve accomplished, and investing in a set of exercise bands can help you add resistance and mimic additional weight. Instead of rows you’ll do pulls with the bands, pushups instead of presses, etc.--and you can experiment with adding reps for effect. It may sound hokey, but mindfulness research points to gratitude and positivity as key influencers of your mental state, which can, in turn, impact your energy levels and motivation. If you don’t already, start (yes, start) a gratitude habit while you’re traveling. Reframe your statements, and think in terms of how great your life is. 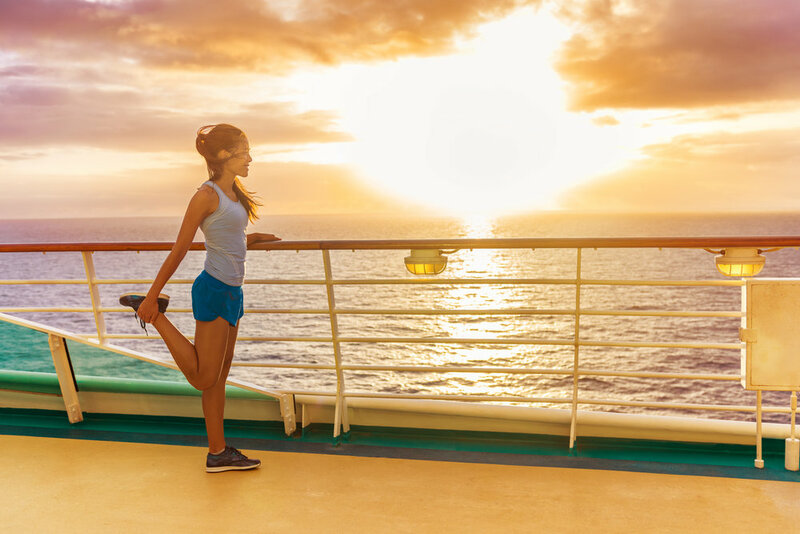 You get to travel for work...you’re fortunate enough to be able to go on vacation...it’s fun to figure out the challenge of adapting your workout plan as you travel. Pollyanna may have had a point, and the positive re-frame game can help you make the little choices that will support the big ones--you’ll see healthy options where you may have glanced over them before, in a state of stress, and you may be more likely to make a tight situation work...and have fun doing it. The truth is, at some point, you will lose ground if you don’t keep up a volume similar to what you were doing before you started traveling. You can maintain it by increasing reps and difficulty, if you’re using bodyweight (adding additional pushups, for example, or graduating to pike position push ups to amp up the exertion), but at some point, if you’re not matching your previous volume and intensity, you’ll lose fitness ground. Estimates vary about when that happens, but some average numbers are about a month for weight lifting, and possibly quicker for aerobic endeavors like running. So, while temporary breaks from your norm aren’t necessarily deal breakers, if you’re traveling long term...you need to address it, and adapt. Find a gym, research a different plan that focuses on body weight, but keep going forward. A mobile lifestyle or occasional travel doesn’t have to mean giving up the gains associated with a gym--find a trainer who offers workout plans that are adaptable for travel, or develop a method of incorporating bodyweight/resistance band training to your current format. Traveling is fun, and staying fit while you do it is possible...just stay flexible, positive, and realistic! Can Working Out Make You a More Confident Person?